Perfect for children's Harry Potter themed shows. 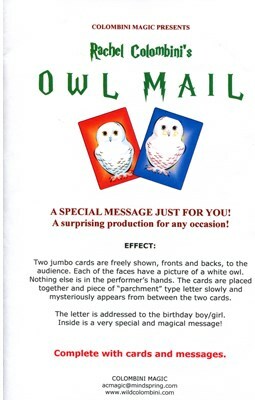 Two jumbo cards with a picture of a white owl on the face of each are freely shown front and back. A story is told how a boy wizard in England gets his mail, by owl! The two cards are put together and magically a scroll of parchment appears between the two cards. The parchment is addressed to the birthday child and it is open and read. It's a birthday greeting signed by "H" the boy wizard of England. Imagine the look of joy on the face of the birthday guest of honor when presented with this greeting. Cards also can produce any other message. Comes complete with two jumbo owl cards with colorful graphics and a supply of pre-printed parchment papers.